Today I am just going to link to a post from one great macro blog with recipes you should definitely try! This time the Sweetveg blog inspired me to try a modified version of the “Vegetables with arame and lemony kuzu sauce“. I followed it quite closely, except I didn´t have celery stalks, so I just omitted those, and instead of the rutabaga (which you cannot find here) I used parsley root. I also used dried/soaked lotus root slices and dried/soaked/sliced shiitake mushrooms (both are suggested at the end of the original post to be used in this recipe). 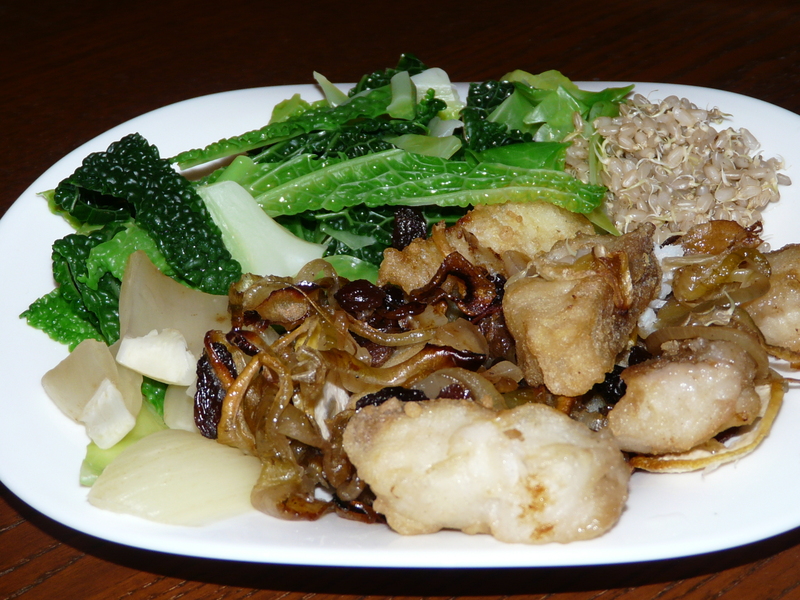 I´m not sure which cabbage was used in the original recipe, but I had the “curly” savoy variety which works great in stews. I didn´t have daikon so I used black radish, which is just another member of the radish family and has a more sharp and earthy taste than the daikon. The sauce I followed exactly. 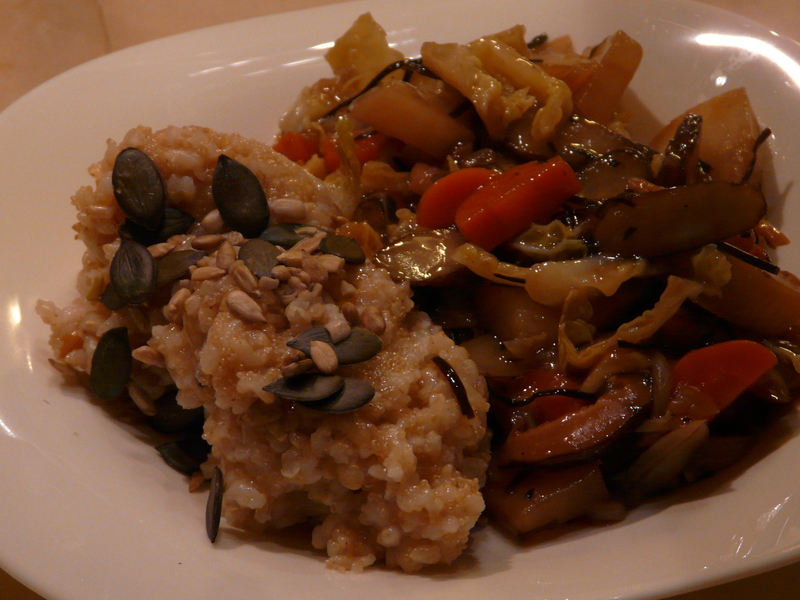 As a sidedish I made a rice/amaranth mixture with roasted sunflower and pumpkin seeds. This is such a simple meal but still something you probably never thought of! I certainly didn´t and I was surprised how two vegetables can create such a satisfying dish. 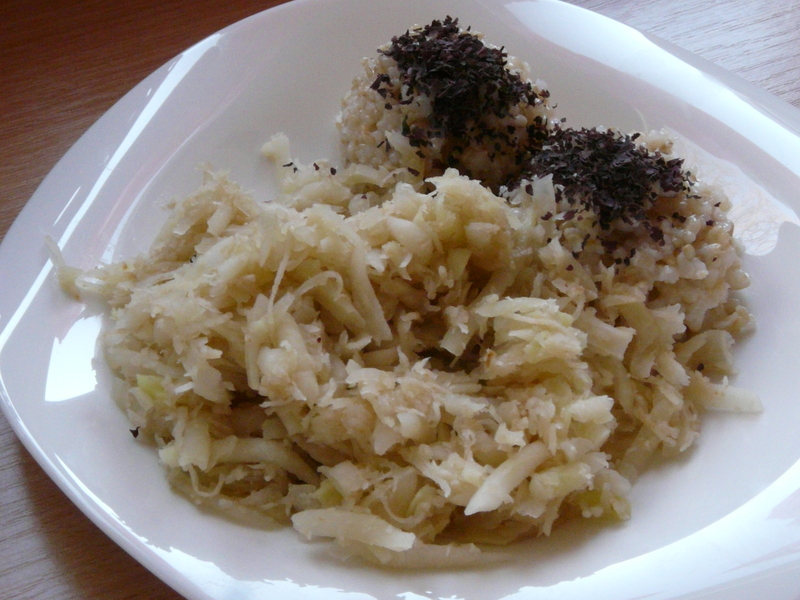 First you have to grate your two vegetables: one medium celery root (grate fine) and one bigger kohlrabi (grate coarse). Pour a couple tablespoons of oil in a deeper pan or pot, place the celery root inside, turn on the flame and sautee the celery root until lightly browned and fragrant, adding a pinch of salt at the beginning. Add the grated kohlrabi and stir-fry until it is softened as well. At the end sprinkle with lemon juice to your liking – the lemon adds a great final touch so you don´t have to be afraid of it! 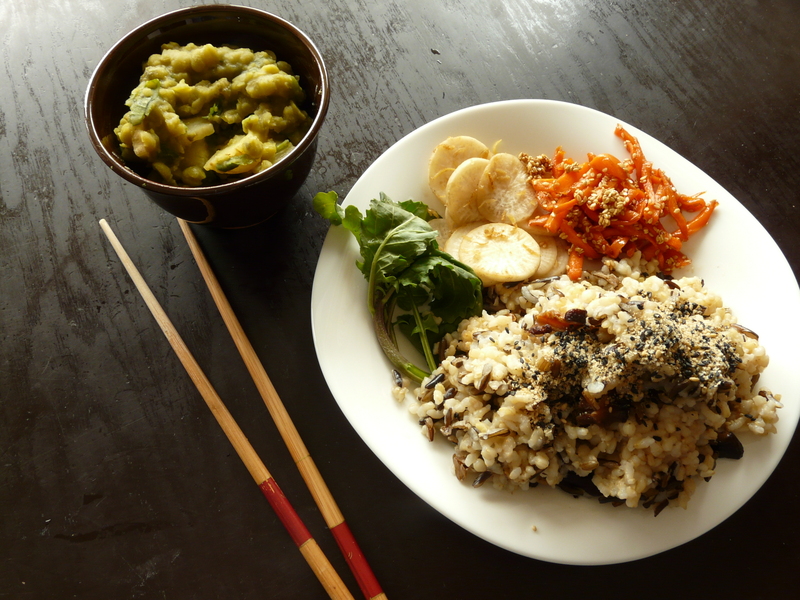 I had the veggies with some rice and dulse seaweed flakes sprinkled on top. I think that I found my favourite fish dish! It takes some time to prepare and is very rich, but worth the time and effort. I had a fillet of black pollock which I cut into bite-sized pieces and dipped them in a glutenfree tempura batter: white rice flour (you could use brown rice flour, but this makes for a much lighter batter), some arrowroot starch, salt, water and a pinch of aluminum-free baking powder. I used about half half of the starch and flour and added enough water to make a batter that is not too thick but also doesn´t slide easily from the fish chunks – you really have to experiment with this one to get the right consistency. I deep-fried the coated chunks until light golden and let them drip excess oil on a paper towel. Then I sauteed a large onion cut into big rings on some olive oil with a pinch of salt until soft and shiny. At that point I added a handful of raisins and some water and covered the pan with a lid to allow the raisins to absorb some water. When the raisins soaked up the liquid, I added a good splash of mirin and continued to cook for a while under the lid, on a low flame. The mirin makes anything cook really fast! I arranged the fried fish chunks in a baking dish and covered each with a slice of organic lemon, peel included. Then I spooned on top the onion/raisin mixture and baked the dish in an oven on about 170°C, some 10-15 minutes, just until the lemons shrink and the onion starts to caramelize. The raisins should not get burnt! The meal was served with a dip of tamari soy sauce, water, lemon juice and wasabi powder, with some blanched greens and with steamed rice sprouts.